Note: Year of the Rooster Pt. 4 and the rest of the questline starts now! The event ends on January 31st at 8am GMT. The trigger for the start of Year of the Rooster Pt. 4 is on January 28th at 8am GMT. The quest kill date is on February 28th at 8am GMT. 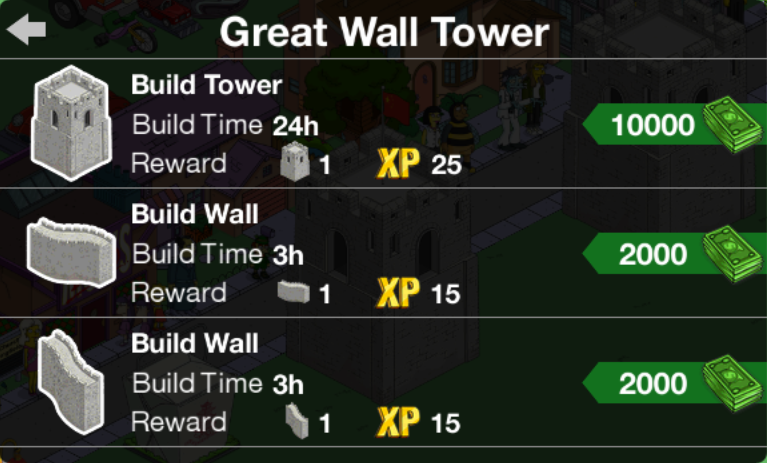 Upon buying the Great Wall bundle, you can build more towers and walls by spending money, it takes 3 hours for the walls and 24 hours for the tower. There is no limit on how many you can have. In the files there’s an indication that after 5 walls built, the time necessary to build more is raised to 8 hours and the money needed to 5.000$ but it never raises at the moment. This could be fixed later. The light on Chinese Lanterns activates and fireflies fly around it from 8pm to 8am local time. Year of the Rooster Statue gives 100 points to Vanity. Great Wall Tower gives 10 points to Obedience. Great Wall Sections give 2 points to Obedience. Yellow Dragon, Red Dragon and White Dragon give 200 points to Vanity and 2.25% Bonus $ and XP. Chinese Junk gives 200 points to Vanity and 2.5% Bonus $ and XP. Giant Takeout Box gives 10 points to Gluttony and a 2.75% Bonus $ and XP. Great Wall Tower (main) gives 10 points to Obedience and a 2.25% Bonus $ and XP. Chinese Lantern, Chinese Junk, Giant Takeout Box, Yellow Dragon, Red Dragon and White Dragon come from Goo Goo Gai Pan. 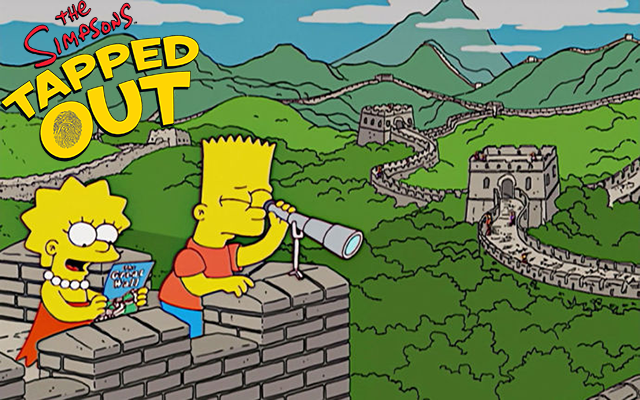 Great Wall Tower and Great Wall Section come from Goo Goo Gai Pan and the opening segment of Treehouse of Horror XXIII. Year of the Rooster Statue appear to be exclusive to the game. What is up w the pins they give Bart? I don’t see them anywhere to be used? Is that the end of the mini update if you dont buy the wall pack? A bit disapointing. Is the wall building a permanent task ? Is building the Great Wall sections a limited time only or can you continue to build them for now on? You can make something every 24 hours, a tower or one of two wall types.